So I was over in Brooklyn this weekend (DUMBO) at a local flea market. While there I ended stumbling upon a very unique antique dealer who carried certain vintage clothing items (Barbour, L.L. Bean, Woolrich, Pendleton, etc.) I happen to love. Anyways, the gentleman and I got into a discussion about our childhood's and the things we use to wear, and oddly enough we had many similarities for having grown up hundreds of miles apart. But that conversation had me thinking of the good ol' day and those timeless pieces I wish I would have kept. Which brings me to present to you all the shoe I grew up wearing (seen above). Like that of the timeless L.L. 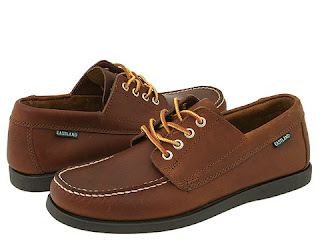 Bean Blucher Moc, the Eastland Falmouth is also a true classic moc built to last. Pick'em up!